Getting a clear and flawless skin is desire of every person in this world.Cucumber is very good for skin whether you consume it or apply it over your face. 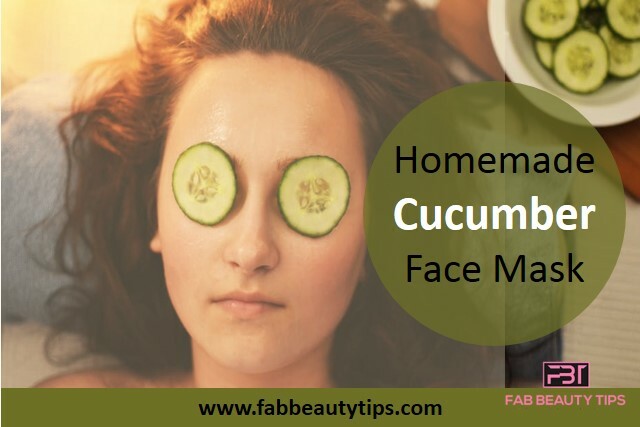 Instead of spending bulk from your pocket, it will be better to make a homemade cucumber face mask readily at your home with low cost which contains no chemicals. Cucumbers give the skin a cooling and relaxing sensation as it contains antioxidants, vitamin A, vitamin C, which are also good for the skin. Cucumber also removes the tan from the skin because of its Lightning and brightening properties. Down below are some homemade cucumber face mask. Mash cucumber and aloe vera together. Apply this pack for about 15 minutes on the skin. 1.5 tbsp of Besan or gram flour- Besan helps in removing the tan and gives you even skin tone. Mix both ingredients to get a paste like consistency. 1 tbsp of curd- The presence of good bacteria in the curd makes it useful to get a glow on face. 1 tbsp of cucumber or one fourth of cucumber cubes cut into small size. Apply on the face for 20 minutes. 1/2 of tomato pulp- Tomato having bleaching properties which is useful for lighten the and removing patches from the face. 1/4 cucumber pulp or cubes or juice. Apply it on clean face for 15 minutes. Then rinse with normal water. 1 crushed potato- Potato is helpful in removing dark spots, blemishes, un-even skin tone. Apply it on clean face for 20 minutes. Remove this mask in the scrubbing motion. 2 tbsp of sandalwood powder- Sandalwood provide a cooling essence and gives a natural glow to the skin. 1.5 tbsp of multani mitti or fuller’s earth powder- Fuller’s earth remove dirt and oil from the skin and make it clear.There are many more amazing Multani Mitti benefits for Face and Skin. 1/2 tbsp of honey- Honey gives moisture to the skin and make it soft. 3 to 4 drops of lemon juice- Lemon is known for its bleaching properties which gives you lighten skin tone and also helps to fade scars. 1 pinch of turmeric- Turmeric helps to tone the un-even skin tone and in removing blemishes. Apply it on clean face for 15-20 minutes. 1.5 tbsp of orange powder- Orange having properties to remove dirt and give you light shade and cooling to the face. 2 tbsp of papaya pulp- It helps reduce pigmentation and controls acne breakouts and wrinkle formation. Some mint leaves- It is often used in cleansers, astringents, toners, and moisturizers. Take some mint leaves and put it in the grinder with a half peeled cucumber. Apply this paste on clean face for 15 minutes. 2 tbsp of almond oil- There are so many benefits of almond oil. It gives the skin a glow and also treated the dark circles. Massage it gently and leave for 15 minutes. 1 tbsp of rose water- Rose water has anti-inflammatory properties that can help reduce the redness of irritated skin, get rid of acne, dermatitis and eczema. 2 tbsp of rice powder- Rice powder gives you the fair look and glowing skin. 3 tbsp of soaked masoor dal- Masoor dal is beneficial for treating many skin problems such as cure dead skin cells, makes your skin look beautiful, your skin texture smooth and bright. It also works as natural exfoliator. Grind both ingredients to get a paste like consistency. 1.5 tablespoon of neem powder. Neem has anti-bacterial properties which is good in fighting with acne problems. Massage it gently and leave for 15-20 minutes. These are some easy homemade cucumber face mask with easily available items from the kitchen. Hope this will all help you to getting a clear, healthy and flawless skin. Cucumber is great for soothing the skin! Thank you for sharing so many masks! Will try! These are some very good easy to make cucumber face masks. Never knew we could use cucumber in so many ways. Cucumber are just best for skin . I loved so many ways to use it . You shared it so nicely i am saving this post to use these ways soon. With summers just around the corner, I am sure this variety of cucumber masks can be helpful for keeping the face clean and cool. That’s a great help to many of us who wish to use products made at home . Shall try been cucumber face pack tomorrow. Cucumber has got great benefits and oh my goodness you have sharing so many options to choose from. Cucumber is an awesome natural detoxifier, be is taken internally or external application. Thank you for sharing such wonderful DIY face packs. Cucumber is refreshing for skin and with so many diys facepacks I can surely make the most of it.